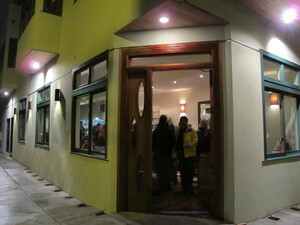 Exterior pic during the opening party. Well, it’s official: the old burnt-out Cafe Organica space in NoPa is gone gone gone, and in its place is a brand-spanking-new building, with ~BISTRO CENTRAL PARC~ now open on the ground floor, and residential units upstairs. The owners are Jacques Manuera and his wife, Claude Belliot, who formerly owned ~BAKER STREET BISTRO~ for 17 years. Chef Nicolas Jardin’s menu features French bistro classics, with appetizers like a frisee salad with lardons, a gravlax tart, French onion soup, and escargots, and main dishes like duck confit with lentils, Cornish game hen with black pepper sauce, fish ragout, and homey dishes like a lamb shank or pasta of the day (all under $22). There is also a set early-bird menu from 5pm-7pm for $17.50, which includes an appetizer, main course, and dessert. Hours are Wed-Fri 5pm-10:30pm, and Sat-Sun from 9am-10:30pm, with brunch from 9am-3pm, light fare from 3pm-5pm, and then dinner service begins at 5pm. The interior is simple and spare, with contemporary wood tables and chairs, a wall of windows, and an open kitchen. 562 Central Ave. at Grove, 415-931-7272.